As a mission community, called by God, Christian Organizations seek to glorify God through social service, evangelism, discipleship and preaching of the Word. As a part of the Body of Christ, Christian Organizations work alongside with local churches for the fulfillment of the Great Commission. In financial operation and ministry development, Christian Organizations should have effective management, and be accountable to their boards and the Church. 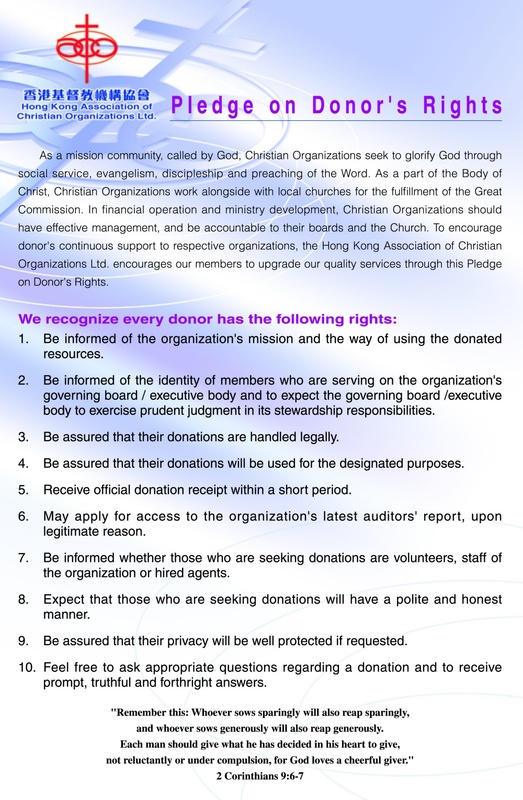 To encourage donor’s continuous support to respective organizations, the Hong Kong Association of Christian Organizations Ltd. encourages our members to upgrade our quality services through this Pledge on Donor’s Rights. 1. Be informed of the organization’s mission and the way of using the donated resources. 2. Be informed of the identity of members who are serving on the organization’s governing board/executive body and to expect the governing board/executive body to exercise prudent judgment in its stewardship responsibilities. 3. Be assured that their donations are handled legally. 4. Be assured that their donations will be used for the designated purposes. 5. Receive official donation receipt within a short period. 6. May apply for access to the organization’s latest auditors’ report, upon legitimate reason. 7. Be informed whether those who are seeking donations are volunteers, staff of the organization or hired agents. 8. Expect that those who are seeking donations will have a polite and honest manner. 9. Be assured that their privacy will be well protected if requested. 10. Feel free to ask appropriate questions regarding a donation and to receive prompt, truthful and forthright answers.